Skyler is an approximately 5-6 year old red male found as a stray and taken to the Humane Society of North Texas, who called GALT. He arrived very, very thin at only 42 pounds, but has gained some much needed weight. Skyler is a sweet, sweet boy who has obviously had a hard life up till now. It is not known at this time if Skyler is small animal or cat tolerant. 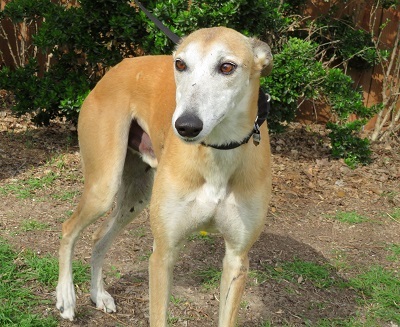 If you're looking for a greyhound with personality, Skyler is your guy. He has deep soulful eyes, large pointy ears, is delighted to see all people, and takes a sheer delight in everything around him. Skyler is playful with people as well as other dogs. Skyler greets each new day, each new meal, each new toy with enthusiasm and happiness. Start saving now because you will want to watch his joy as you present him with new toys. He is a Velcro boy who will lick your hand as he follows you around. He'll gladly play tug of war with a toy and you. Next to you, toys are his most favorite things. He collects all the toys (and bones) from the toy boxes and deposits them by or in his crate. Skyler will keep you laughing. You'd never guess Skyler was a stray and so thin when he arrived. While he has the physical scars to prove it, he has the most resilient of souls. Evidence of him having been a hungry stray was in his wanting to get all the treats and get every treat first. Now he waits his turn until his name is called. This is one happy happy boy! Absolutely everything makes him happy, including standing outside in the rain, walks, food, treats, toys, and getting loved on. His ideal home should have another large dog, people to adore and plenty of toys to brighten his world. Skyler is a lesson in forgiveness and enjoying each wonderful moment of life.